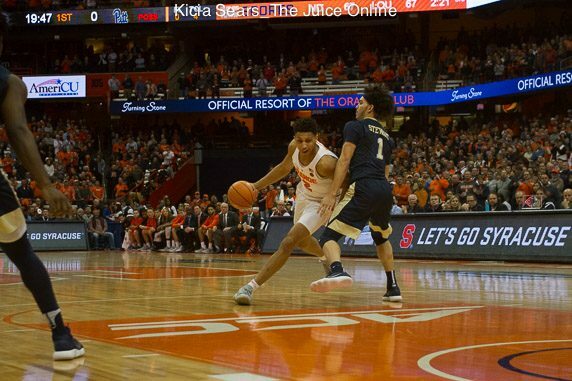 Matt Moyer drives early in the first half of Syracuse's game. MANDATORY PHOTO CREDIT: Kicia Sears, The Juice Online. And the best sports cover from the Super Bowl goes to… On to today’s recruiting links! 2019 guard Joseph Girard III, New York’s all-time leading scorer in high school basketball history, has an offer from Syracuse. He tweeted on Friday that Syracuse had offered, and he already holds offers from Oklahoma and Boston College, among others. 2018 defensive end CalebOkechukwu took his official visit to Arkansas this weekend and announced via Twitter that he will be making a signing-day decision between Syracuse, Texas and Arkansas. The Washington DC product visited Syracuse the weekend before. He is rated three-stars by 247 sports. 2019 defensive back MikeSainristiltweeted over the weekend that he received an offer from Syracuse. The Massachusetts product is a three-star prospect, and holds offers from Boston College, Indiana, Michigan and UNC, among others. BryceNelms visited Syracuse for its junior day over the weekend and tweeted that he had picked up an offer. The New Jersey defensive lineman has offers from Rutgers, Minnesota and Temple among others. 2019 Ohio linebacker LukeFulton also has an offer from Syracuse, he tweeted. He’s rated three-stars and holds a national rank of 532 from 247 Sports. Other schools to offer include Boston College, Rutgers, Duke and Kentucky. Syracuse.com’s Stephen Bailey writes that AkeemDixon will sign with the Orange this week. Dixon had committed to Syracuse earlier in 2017, but the Vero Beach (Fla.) running back, rated three stars by 247 Sports, didn’t sign during the early signing period because of academic reasons. Those have been cleared up and he will sign his NLI on Wednesday. That’s all for today. Have a great start to your week, everyone!